The Summer Hat is the freshest Boater to hit Spring this year. With the perfect balance of Mesh and Lace, this hat is understated elegance with a dash of cool. 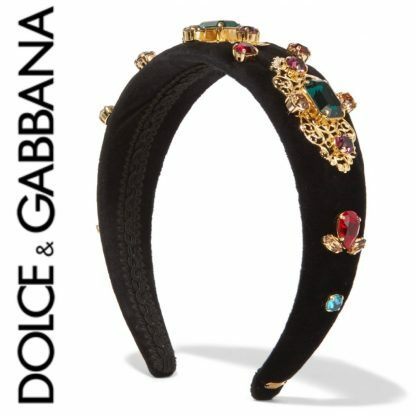 Dolce & Gabbana’s headband is crafted from plush black velvet. This ladylike style is beautifully adorned with shimmering claret, forest-green and cognac crystals placed atop decorative gold filigree plaques. This striking leather boater features a contrasting red velvet ribbon. Wear the velvet ties looped at the back of your hair or tied in a bow for a more fashion-forward look. Dress up your outfit with the exclusive print Dolce Head Tie. With an easy tie band, it will take your outfit from chic to complete. We are crushing on velvet this season and for those of you in the same boat- the Georgia headpiece will satisfy any of your velvet cravings! 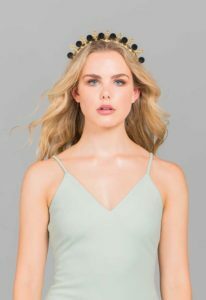 From the new range by Heather McDowall, simplicity is key, and with the combination of the Baroque style cross and gold embellishments, the Georgia headband will quickly become a staple in your wardrobe. A regal standout piece, the Mariana Crown consists of a vintage golden base encrusted with black enamel florals and striking red jewels. This piece also features hand-painted intricate detailing for extra effect. Dolce & Gabbana’s Spring ’17 show saw models’ heads topped with tiaras, fruit and flowers. This silk-satin headband is twisted at the front and patterned with pretty pink roses, blue butterflies and the label’s signature. 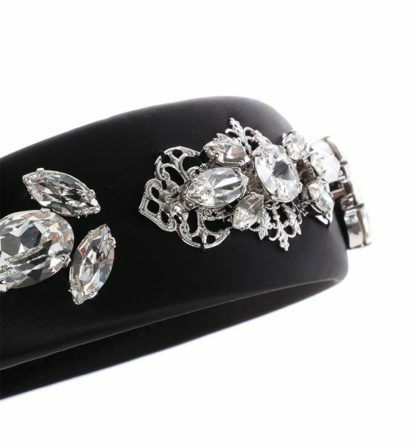 The Annabelle headpiece is a modern take on a traditional style. This unique design is for the fashion conscious that start the trends- not follow. 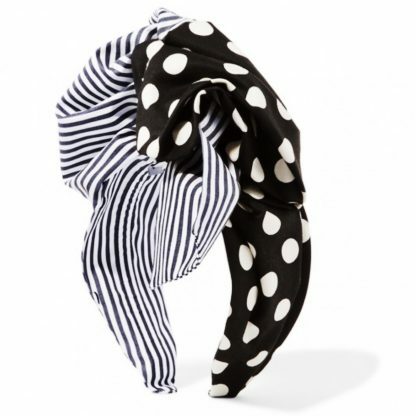 Dolce & Gabbana’s cotton black and white headband is twisted at the front and patterned with spots and stripes. Dolce & Gabbana’s black headband is beautifully adorned with shimmering crystals placed atop decorative silver filigree plaques. Just in time for Spring Racing! 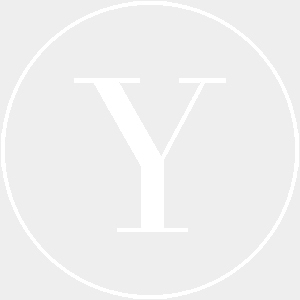 Hire the stunning hand made hidden dream crown by Australian designer Christie Millinery. 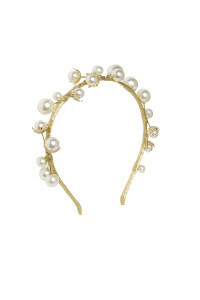 Gold headpiece with white pearl detail. Great accessory for any race day or Hens party on the Bride to be. 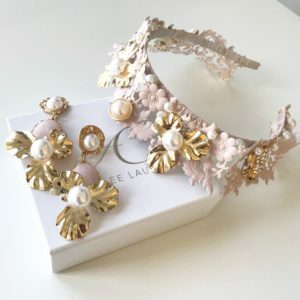 This lightweight crown consists of a light dusty pink base encrusted with golden florals, pearl embellishments and delicate insect gems to create a gorgeous pastel piece for any occasion. The Zariah Crown also has matching earrings to create a truly beautiful look. Measures approximately 2cm in height. Set on a thin headband. Luxe silk abaca Urban Turban by Murley & Co in red - completely adjustable by adjusting the size of the knot. A spring racing favourite. Luxe silk abaca Urban Turban by Murley & Co in black - completely adjustable by adjusting the size of the knot. A spring racing favourite. Luxe silk abaca Urban Turban by Murley & Co in blush pink - completely adjustable by adjusting the size of the knot. A spring racing favourite.